Lots of moms relate that while their child has no trouble urinating into the potty, they refuse to have a bowel movement there. This leads to painful bouts with constipation, a crying child, and a puzzled and frustrated mom. Sometimes the child will make in his underpants or in a pull up, but just won't go in the potty or the toilet. So, what's a mother to do? First off, it helps to understand the nature of your child's stubborn refusal. Children don't have a lot of say in what happens to them, and when there's a chance to have a bit of control over their destinies, they will seize and wield it without mercy. 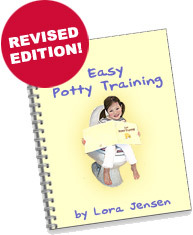 A person can only go so long without peeing, but a bowel movement is something your child can hold onto at length. So, he does. It's a kind of turf war. That's not to say that your child is happy with his need to hold onto his bowel movements. He has physical discomfort due to constipation, and he's having emotional discomfort from displeasing you. He feels a great deal of stress at his situation, but is powerless against his need for power. Without a way to break this cycle, your child may end up with a hard, impacted stool. If this happens to your child, call the doctor and ask about using a stool softener. But, before you get to that point, it may be possible to find a way to break your child out of his self-imposed misery. Children like choice, because this gives them a feeling that what they want, counts. Parents can use this desire for choice to their own advantage and bolster their child's self-esteem in the process. For example, if you want your child to eat vegetables, you can ask your child whether she wants beets or peas. If you had offered your child only one type of vegetable, chances are she would have shut her mouth tight. When your child is in charge of her own destiny she feels good about making a choice. Keep in mind that the choices you provide must be within reason. 1)You can have your bowel movement in a pull up. 2)You can have your bowel movement in the potty and get a prize. Even if this doesn't succeed right away, keep on making the offer. In time, most kids wise up and make the right decision, though you'll need to make sure the prizes are something that she feels ready to work for.